Lorenzetti's pioneering secular frescoes in the meeting hall of the Nine Governors (Sala dei Nove) in Siena's Palazzo Pubblico are among the greatest achievements in the history of art. Now art-lovers can appreciate these ground-breaking paintings guided by the scholarship of a well-known historian. 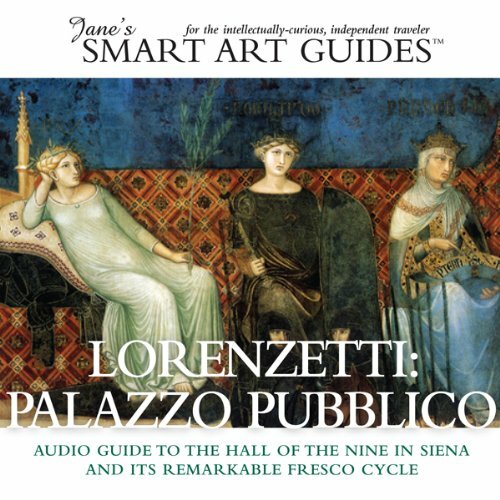 Lorenzetti: Palazzo Pubblico is the exclusive audio adaptation of the popular book in The Great Fresco Cycles of the Renaissance series, written by the renowned scholar of Italian cultural history, Randolph Starn, Professor Emeritus at the University of California, Berkeley. Jane's engaging narration reveals the historical context, the lofty civic ideals, and the artistic genius that coincided to create these powerful images. The consummate political statement made by these paintings contrasts the effects of good and bad government, a dynamic at the heart of the experiment with republican rule in medieval Italy. The guide is for armchair travelers too! You don't have to travel to Siena to appreciate Lorenzetti's magnificent frescoes in the Sala dei Nove. Create a virtual visit as you listen to the narration. In the PDF booklet (see below), there are small pictures of the frescoes, keyed to the track list. And you can see large images of the frescoes at www.audioartguides.com. With Jane as your audio tourguide, you will become absorbed in the story of the Sala dei Nove and of Siena's heyday, and experience a deep and lasting appreciation of the significance of this remarkable room. The 40-minute "Slice of History" background segment is meant to be listened to first. It provides historical context to enhance your appreciation of what you'll see when you take the on-site tour. A printable eight-panel PDF file includes a floor plan of the upper level of the Palazzo Pubblico, and images keyed to the audio track list, to help keep you oriented. I would recommend this for anyone interested in Renaissance Art or the very little known Siena history. Most travelers to Siena only see the Duomo and Piazza del Campo. This account of the Frescos should offer tourists more detail about the hidden art works in the city that is normally only known for its Palio. This book should accompany everyone thinking of visiting Siena. Would you be willing to try another book from Randolph Starn and M. Jane McIntosh ? Why or why not? Yes, I would like to try another book by Randolph Starn and Jane McIntosh. Did M. Jane McIntosh do a good job differentiating all the characters? How? Yes.The narrative is not too overwhelming description even for novices. I would prefer more historical detailed for the price of the audio book.